When a boy is driven insane by God’s thrusting prophecy on him, a school of prophets rescues him and restores him to health. I opened my soul to God and he invaded it, making connections across the walls between souls, across the walls of time. Two things stand out in reading passages from Jeremiah. One is the extraordinary violence with which he speaks of his anointing as a prophet. Another is the hallucinatory nature of his visions. It seems that he could never see any object as what it simply was. Instead, everything was overlaid with other images and imbued with deep, often catastrophic meanings. 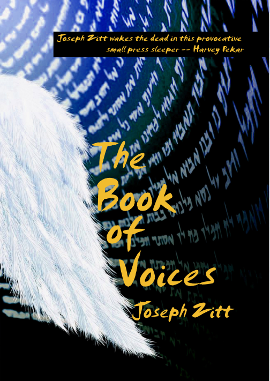 Jeremiah’s voice was one of the most difficult to approach in creating The Book of Voices. Jeremiah was already well-represented in the Bible by his own first-person monologues. I feared that I wouldn’t be able to find a space in his story within which to write. It dawned on me, though, that there were periods in his life, especially between his call to being a prophet and his beginning his career, that were less well documented. When I got the image of the voices and hands leading him down a corridor, and saw how it might connect to the evolving concept of the hidden school of prophets, I was able to begin. Jeremiah’s voice in the Bible is one of almost incessant complaint, and few listened to him. In reading his books (Jeremiah and Lamentations), I was struck by how vividly he saw possible futures. I also noticed that his mentions of women, either as people or metaphors, seemed to fixate on harlots and adulterers, and I looked for something in his past to which I could connect it. While God granted Jeremiah his wish of becoming a prophet, the transformation was so harrowing that others might have questioned if the ordeal was worth it. Jeremiah, however, accepted the role and went on to speak forcefully on God’s behalf for the rest of his life. Have you ever wanted something so much that you were willing to go through a painful experience to attain it? Did you indeed have to go through that experience to get there? If so, was the result worth it? Knowing what you do now, would you go through it again?